We offer a comfortable waiting area with complimentary beverages. We will provide transportation if needed. Our certified estimates will quickly and accurately determine the cost to repair your vehicle with CCC Pathways Computerized estimating and digital imaging. Our staff will explain the repair process, answer any insurance question we can to get your vehicle on the road as soon as possible. We offer deductible assistance if necessary. Every vehicle has a written lifetime warranty provided at the time of pickup. 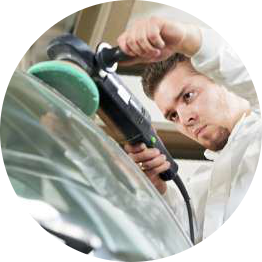 We know that repairing your vehicle to pre-accident condition is critical. Our highly trained I-Car, ASE and 3M certified technicians use state of the art chief frame machines capable of mulitpulls along with genisis computerized laser measuring system to restore your unibody and full frame vehicles back to pre-accident condition.Our staff mechanic is ASE certified to repair suspension, exhaust and Ale systems along with other mechanic problems that may occur as a result of your accident. We use PPG paint products along with computerized color matching Enviorbase High Performance waterbourne paint help us protect the environment with low voc output.Nearly 75% of all vehicles today from the manufacturer have waterbourne technology. This assures a proper color match. All vehicles are baked in our Devebis Spray bakebooth to achieve the highest durability possible.